Explore interactive maps created by Nature Conservancy staff around the world. 8/19/2016: A link to an interactive visualization of climate-associated animal migrations is now available in our map gallery. 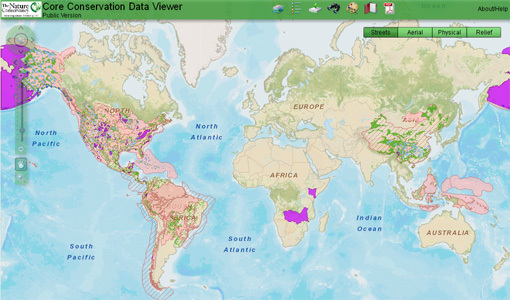 8/22/2013: We have rebuilt the digital Atlas of Global Conservation to perform better and add functionality. 11/05/2012: A new map showing where The Nature Conservancy works is now available in our map gallery.